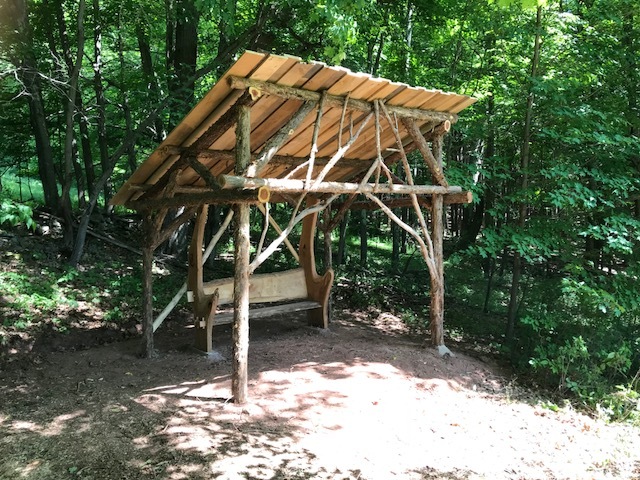 A new summerhouse has been built for the top of the meadow at Woodchuck Lodge where visitors and board members go to cherish the stunning view across the Catskill Mountains. Members of the board are also looking for a small, portable library to put inside the summer house. The idea came to board members as we completed the Trout Lily Trail, to extend the trail to the east into the hog lot. We would then lengthen the trail, transition from forest to meadow at the break in the stone wall and utilize more of the property. Now, while capturing that view, visitors can sit, rest and perhaps even read awhile if we are to get our tiny library. Steve Walker, of Beaverdam Builders, built the summer house. 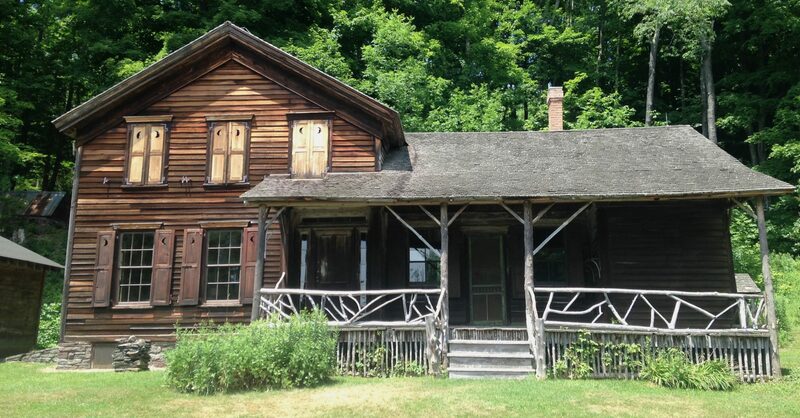 We provided the rough draft of what a turn of the century ‘summerhouse’ looked like. We chose red cedar for durability, round poles and twig lattice for aesthetics, a rustic bench with a simple shed roof, all to blend with the ambiance of Woodchuck Lodge. We were seeking a modest structure to match both the man and, certainly, the budget! “The agreement we struck was if I were to secure the materials, he would build it” says Patti Rudge. On a tip from RyanTrapani @ Catskill Forest Association, we purchased the cedar from Todd Baldwin in Dutchess County. The hemlock, on the other hand, was harvested locally and milled just down the road in Halcottsville by John Biruk. With the ground firmed up from spring rains and a high pressure holding, Steve had his crew up in the hog lot in the second week of June and added a bit of magic to Woodchuck Lodge. The summerhouse ‘under the maples’ is waiting to be discovered.